The most beautiful moment in the life of a person, man or woman, is when they hold their newborn child in their arms for the first time. The magnitude of happiness in this context cannot be judged by a person’s financial capability if he’s rich or poor. Sadly, in our country, only the rich or the middle-class actually enjoy the process that leads to the birth of their children. This is not an overstatement. 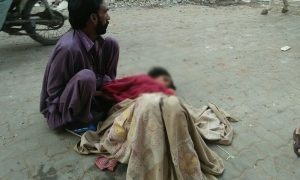 Yesterday, in Raiwand, a woman had to give birth on the streets outside a government hospital — because the couple couldn’t afford a private one. The sad state of affairs at the government hospital proves that the poor of Pakistan have to think twice before bringing a child into this world because just as what happened before, there would be no doctors present at the government hospital or some other negligence would overpower the childbirth. The woman from Lahore had her loving husband with her, one who took care of her while she gave birth on the road. It is pertinent to add here that this government hospital was next to Nawaz Sharif’s farmhouse and Chief Minister Punjab Mian Shehbaz Sharif spent 70 crores to make this 60 bedded hospital. Imagine, 60 beds in a government hospital with no doctor present, then what is the poor populous to do other than giving birth on the roads of Pakistan? 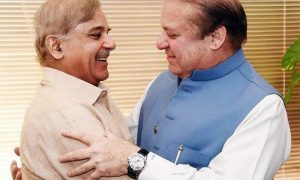 Why do the PML-N government and Mian Shehbaz Sharif boast so much about the ‘infrastructure’ and development they’ve brought in Punjab when a woman in the capital city cannot afford to give birth to her child? Apart from the hospital and its way of handling the ordeal, the doctor who was to be present at the hospital during those hours should be served a show-cause notice by the government for her negligence and lack of diligence. All across Pakistan, government doctors are the same. They sit on the payroll of the government and do their clinics privately to earn handsomely from both the places. To their clinics, they give full time because pharmaceuticals pay them a lot of money (plus foreign trips). As for the government hospitals, earning 70-80k by showing up for one hour doesn’t sound that bad. The Health Department of Punjab, especially the Secretary himself, should take a keen interest in this sad incident. Every government hospital should have a standby nurse who is trained enough to help give birth to poor women who cannot afford hospitals.